Solving OutOfMemoryErrors (part 7) – APM tools as a solution? Our series of posts about solving the OutOfMemoryError in our hypothetical production system nearing the conclusion. We have covered a number of different ways to attack OutOfMemoryErrors so far – profilers, JDK bundled tools and heap dump analyzers. Our today’s mercenaries will be Application Performance Management tools, or APMs. APM solutions are positioned as the Holy Grails on the quest for solving your production environment’s performance problems. You just setup an APM tool of your choice, let it monitor your whole cluster from front-end load-balancer – or even the end user’s browser – down to your Oracle or Neo4j database and then relax in that Aeron chair of yours. APM provides you with all the information your operations or developers need in order to achieve a desired level of customer satisfaction. Our fist list of APMs to try consisted of 5 names: AppDynamics, CA APM (former Introscope), dynaTrace, HPjmeter and New Relic. HPjmeter fell away at once, as it is available for HP-UX platforms only. New Relic has no memory leak tracking capabilities yet, so there we lost a second contestant. For CA APM and dynaTrace we were unable to obtain a free evaluation version. This left us with AppDynamics alone. Kudos for the AppDynamics team who gladly provided us the opportunity to try the solution! The screenshot above is only a subset of the information provided on the screen. It is scrollable all the way down for much more graphs and trends and data. Which is all nice, but not exactly what we were looking for. This all happened while my application was crashing with the OOM. No luck here today. It was very difficult for me to write this post. First of all I had only one tool to test, and getting even this one was not an easy task. Secondly, I wasted several hours before I saw the first bit of information in AppDynamics dashboard (do not ask, I will not write about it). And thirdly, I have no results to show to my readers. But here we are and what can I conclude from this experience? 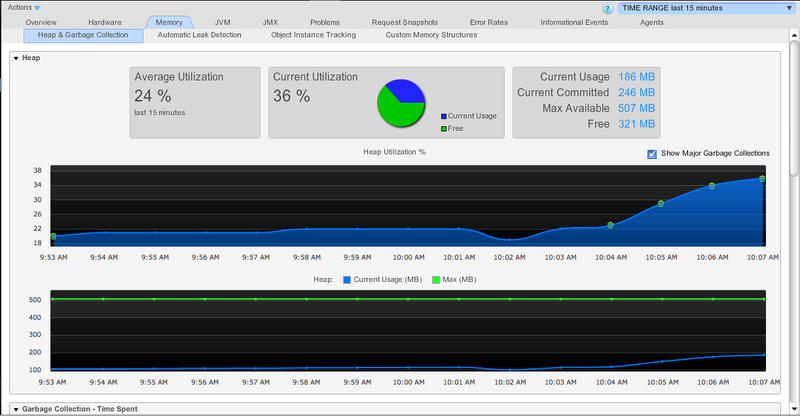 APM tools give you tons of information about inner workings of your application performance-wise. But I was hoping for something answering my question ”Why do I have a memory leak and what should I do?” more directly. All in all, APM solutions can be great tools for monitoring and proactive planning of performance related maintenance of your application. I cannot recommend it for problem solving though. P.S. If you can point to any other tool for solving memory problems in Java applications that we have missed, or can provide us with evaluation licenses for aforementioned products, we will be glad to hear from you. Just contact us at support@plumbr.io or @JavaPlumbr. was AppD to detect memory leaks at appsphere for appdynamics tested for this .